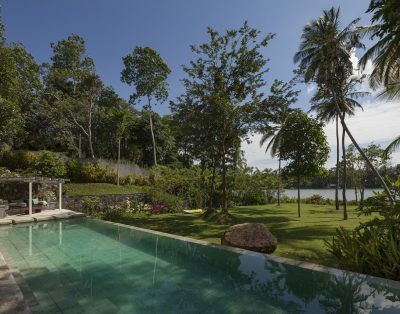 5 bedroom Luxury Villa overlooking the Koggala Lake, Galle, Sri Lanka. Located on the Eastern shore of the lake, it offers spectacular views of the sunset across the lake. Christmas and New Year period: change over must be on 28th or 29th December (minimum 7 nights). This is a 5-bedroom luxury villa that boasts a sublime situation on Koggala lake. 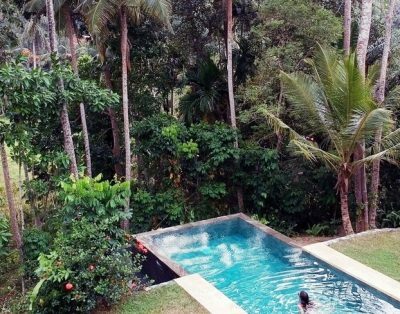 Influenced by modern vernacular and designed by one of Sri Lanka’s leading architects, Villa 81 sleeps 10 very comfortably. Equipped with 20-meter infinity pool, hammocks, sunbeds, and a pool table, you are unlikely to want to leave. However, this villa’s prime location means you are also near to the South Coast’s best beaches, surf breaks and a plethora of wonderful local activities. In the early morning hours, you can see fishermen on their wooden canoes row back to the adjacent jetty with their catch of the night whilst the monks in the Buddhist monastery on the opposite shore chant their morning prayers. The villa comes fully staffed with an excellent chef, a house keeper, a assistant housekeeper, a care taker, a gardener and 24 hour security services. This Villa is a five bedroom property. The main villa has Five bedrooms: Each air-conditioned, with a four-post bed and a large bathroom overlooking the lake and with outside shower. Two of the rooms are interconnecting, making it ideal for families with children. Bedroom 1, 2, 3 & 4 (Master suites – 2 interconnecting): King size four poster bed with mosquito net, AC, ceiling fan, floor to ceiling doors opening onto private terrace revealing garden & lake views, en suite bathroom with outdoor shower & indoor bathtub. Bedroom 5 (Garden suite): Queen size four poster bed with mosquito net, AC, ceiling fan, walk in wardrobe, sitting room with Satellite TV/DVD, desk, pool table, en suite bathroom with outdoor shower and terrace onto garden & lake views. The Villa’s chef specialises in Sri Lankan cuisine but also caters to Western preferences. His curries are very popular, so is his seafood sourced from the lake and the sea. The chef uses fresh produce from the nearby markets or the villa’s own garden. The kitchen is flexible as to mealtimes. Alcoholic beverages are not provided but staff can purchase alcohol on behalf of guests. Tropical breakfast is included in the rate. Chef is capable of western and local dishes and payment is on an ‘ingredients only’ basis + transport. For more information on how it works, read more about Villa Meal Policy in Sri Lanka. This Villa is suitable for small events, celebrations and weddings. It can accommodate up to 100 guests. Contact us for more information and rates. LOW SEASON: Exclusive use by the room rates available. Please enquire us.